Home > Go Green > Green Tips > Getting Married? Go Green!!! Like building a house, planning a wedding is not necessarily a set of linear steps. There is a priority list to build and that's the purpose here. Set the date and start rolling from the outline below. I got into planning green events because so many people come to Hawaii for a tropical wedding. Living in tropical paradise, the location attracts many who are Earth conscious and wish to leave a minimal footprint for their event. Yet regardless of the location, a conventional hotel or resort is not likely to please the couple who seeks a green wedding. The feel of standing in a lush garden, by an ocean shore or waterfall is more like it. Think nature merged with creative-personal style. Fortunately, it is easier to find such a non-commercial or corporate-managed destination than a decade ago. No problem for a small group to lodge, but larger gatherings may require a string of bungalows. Property owners typically collaborate well and especially if you don't live in the region, a planner who does can be your best friend on such a mission. Once the setting is confirmed, decide how many people you wish to share your special day with and if convenient lodging is available for traveling guests. Most likely, the property manager can connect you with a proper officiate or find oh-so-many programs on the on the net for that purpose. But again, a local planner is ideal for the proper connections. Of course earth-friendly attire is hip with a purpose. Ethical materials are hemp, flax, organic cotton, natural wool and silk. Many creative designers strive for the "sustainable" status and incorporate vintage or recycled materials as well. If into custom creations, remember to allow at least 3 months for fitted perfection. Good idea to have a local seamstress on hand and that's a task the planner can help you with also. When it comes to invitations, I get pretty excited. Most companies that offer recycled papers also sell seed-embedded invites. Especially with the seed-embedded choices, there are terrific table favors, tags, place cards, replies -- even confetti. Recipients can enjoy the memory of your wedding as they witness the growth of wildflowers and herbs after the occassion. Tree-free is the focus whether you utilize several or one resource; -- simply invites or more. Is the ceremony going to be the same location as the reception? Something to think about. Some want a small group for the ceremony and larger for the reception. Ponder footprints again at this stage of planning. 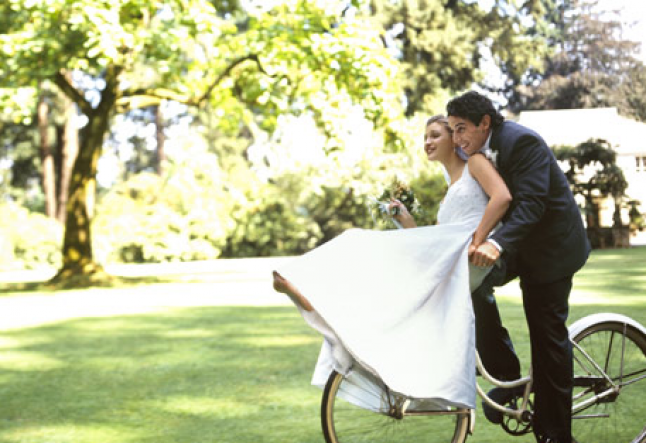 It's natural for green-minded couples to want healthy food for their wedding reception, but ask about recycling too. Thankfully, small property owners and green wedding planners operate that way on an everyday basis. Even the "green status" hotels do a poor job at recycling and are known to deceive inquirers. Eco-savy people take pride in their environmental concerns and today there are more supportive services than ever before. After all, it’s so very natural to show respect for Earth with a conscious-natural ceremony and reception.